Advice on how to use weather forecasts as a cruising sailor. The reasons for the imperfections in weather forecasting are discussed on other pages of this site, see pages on weather forecast problems, "precision in forecasting and Forecast Accuracy . The ideas developed may be of interest and, I hope, use to others. Numerical Weather Predictions are better now than ever before and forecasting has improved more or less steadily over the past 30 years. That is not to say that everything is perfect. Far from it. However, the longer period forecasts from 3 to 6, 7 or even 8 days ahead have shown a quantum leap from the time when I last worked as a forecaster, back in 1977. See my page on background to the forecast written in an article]] for the Cruising Association . There is a mistaken impression, and enshrined in the memories of some sailors, that the local old salt is a fount of meteorological wisdom. This is a travesty of the truth. A falling barometer, backing wind, increasing cirrus are good indications that a warm front is approaching - BUT, how fast will it come? How far will the wind back? How strong will it become? When will it veer? And so on. What the local expert can do, is to know just how the weather behaves in his particular area in a given weather situation, how the sea breeze behaves, whether those hills give protection from showers in a north-westerly and so on. It should be rare to experience strong winds on passages (of up to 24 hours) of more than one force above that expected on the basis of the forecasts. At the lighter end of the scale, the picture may not be so rosy but then there is less danger and the engine is always there to get you out of trouble or to get you into harbour before the bar closes if the wind falls unexpectedly light and contrary. A list of Marine Meteorological Services is available on another page of this site. The big question for the sailor, usually with little formal training in meteorology, is how to use this very important but imprecise service. The notes below are ideas based largely on my own experience of many thousands of cruising miles. Obviously, they are written in the light of my professional meteorological background, especially my ten years in mid-career as a Senior Forecaster with the UK Met Office. First, look at forecast charts and see if it is a situation where the main interest is large scale or small scale. Is there a front coming with a major change in wind and weather or is the devil in the detail? Interest then may centre on the formation of a sea breeze or the way in which the wind comes on to the coast. Secondly, what is the forecaster saying? He (or she) will have seen the results of forecast forecast model ensembles and have some idea about confidence in the forecast. The Met Office runs its Numerical Weather Prediction every 6 hours using all the data received during the intervening 6 hours. Listen or read texts of forecasts over the past 24 hours to see how the forecast has changed; how the emphasis and confidence of the wording has changed in the light of later data. Is there a trend? Are there inconsistencies implying uncertainty? Tools to use: - The BBC Radio 4 Shipping Forecast, local radio, Coastguard VHF are all useful in indicating whether it is go or no go. Look at meso-scale forecasts on my list of objective forecasts. Compare these with output from the Met Office Meso-scale model available on the BBC marine weather pages. However, most important will be your own local knowledge of how the wind is likely to vary locally due to the effects of topography. Good starting points will be found in books by David Houghton and Alan Watts Out of print but try your library). Both were good observers of weather and well able to relate what they see to local topography. Effects of headlands, cliffs, straits and channels. Forecasters can already build these effects into their NWP models although not yet on the very small scale of, say, Torbay. Just how this very detailed information will be made available to the sailor has yet to be determined. Perhaps the displays on the MeteoCiel site is the best that can be achieved. Do I have a weather window now? Is a window opening or closing? If so, then where do I want to be before it arrives? Is the intended destination sensible? Will we regret going there? Will we regret not going? For example, there is little point in popping across to Cherbourg for the pre-Christmas wine run if you are going to have strong Northerly winds for the following week. Similarly, if going to cruise South Brittany, a first stop at l'Aberwrac'h might not be sensible if you have to stay there for a week with westerly gales. The 3 to 5 day outlook available on UK NAVTEX and on the Met Office website. All the time, keep a weather eye open for problems. Will you be able to delay a day or so or are you going to have to come back by ferry? 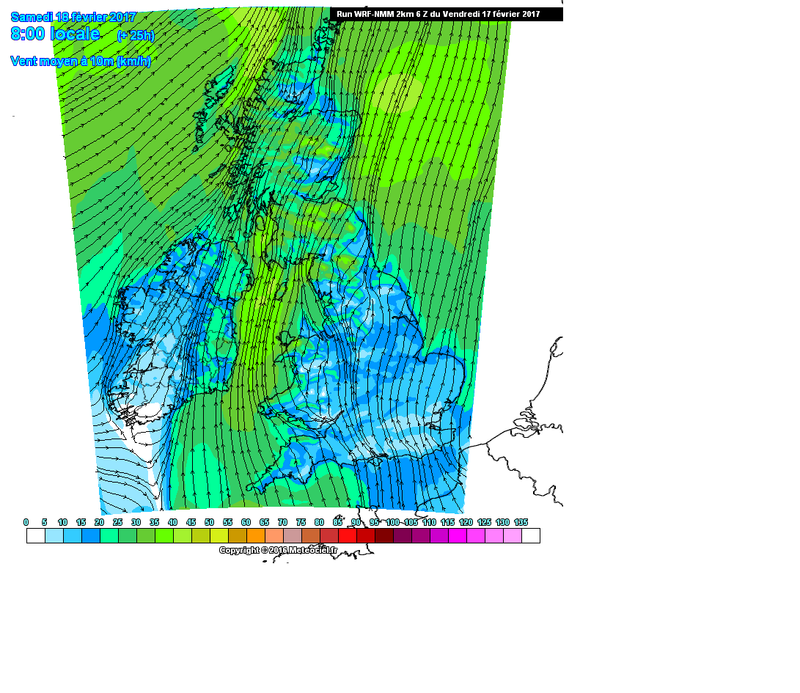 Does it look as though the trip is going to be possible in terms of wind direction and strength? Are the forecasts fairly consistent from one day to the next? (Consistency is a reasonable indication that the atmosphere is in a predictable mood.). Look for trends in the forecasts. GRIB files provide a powerful tool for looking at consistency. 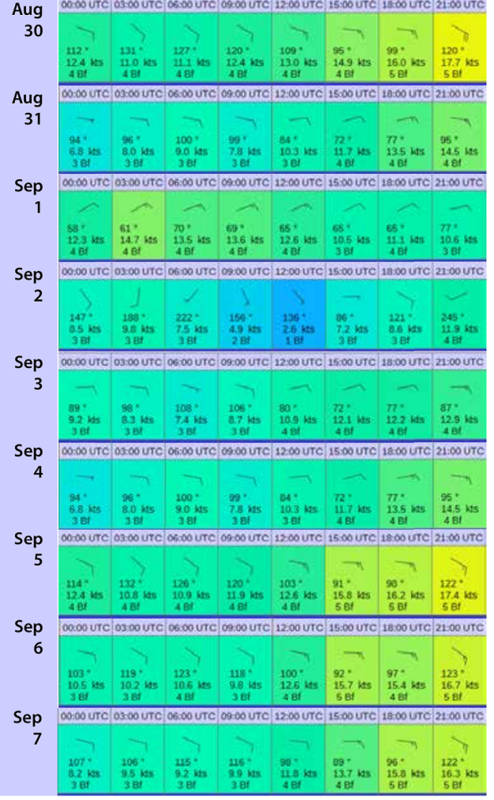 These are nine forecasts on successive days for a point near Channel Light Vessel all for 7th September 2016. The day that we returned to the Dart. We knew several days ahead that 7th September would be a good day for our crossing. Of course, there is not always this degree of consistency. When there is not then there is greater uncertainty to be built into your plans. MRCC VHF Inshore Waters forecasts. Before departure ask yourself if there are any obvious (or not obvious) potential problems? What about wind direction? Might you have to be beating and how will that affect your ETA? In particular, what if the wind is a little stronger than forecast? Is it still within your limits? What does the longer period look like? Does it look settled? Or does it look like being changeable? If so, then your plans for the return could all too easily go awry. Remember that the secret to enjoyable and safe cruising is the avoidance of tight deadlines. A little forethought and consideration of outlook forecasts can save you anxiety - and money. Both are sobering thoughts. For longer passages, lasting around 3 to 5 days - and longer? Follow the same initial approach - keep listening and watching all the forecasts that are available (and relevant). Try to see how reliable the weather situation is. If you have HF/ SSB radio and RadioFax then keep taking the charts. Watch for changes in the patterns. Is the wind still favourable? Is the direction tightening up on you? Try, also the DWD RTTY service. The US GRIB coded forecasts are probably the most useful as outlook tools, but remember that they underestimate strong winds by about 20%. I add one Beaufort force to forecast winds of 15 knots or more. The DWD service of five day forecasts of winds at a few grid points is very useful as a genuine second opinion. The NASA Weatherman is a good bit of kit if you do not have HF/SSB radio and decoder software on your computer. Without HF/SSB, Radio 4 may well be your only source of data. But this only gives 24 hour forecasts. Listen carefully for changes in the forecasts. Keep checking that the forecasts are reasonably in agreement with the forecasts that you started out with. Watch out for that little insidious "perhaps later...". Keep an eye on the NAVTEX forecasts which usually include a very brief outlook that warns of severe weather, however, do remember that it is orientated towards SOLAS ships and may not make much of that nasty little thundery low that can blow your electrics skywards. UK NAVTEX gives a 5 day outlook which is rather more useful, but this is only issued once a day. Returning from abroad, much the same applies. Marinas in both France and Spain quite often have the longer period forecasts on display (but, just check that they are the latest issues). The UK Met Office does not have a monopoly. Use the Internet. Text forecasts are usually quick to download and cheap, even over a mobile or satellite phone. For oceanic passages, read my page on Forecast Accuracy Limitations. From that you will realise that six or 7 days is about the limit on useful predictability. For a slow moving yacht, that means that you really have to plan on the basis of climatology. For fast moving yachts, doing well over 400 miles a day, weather routeing is a practical proposition. Not so for a yacht doing 100 to 200 miles a day. This view is supported by a leading high speed racing navigator. The following are uncertainties that occur in forecasts. They are not usually questions that the yachtsman can begin to answer, but they do point to the uncertainties even with the current state of the science. REMEMBER - the computer predictions give the best answers possible and not the best possible answers. Where/when will the next one form? The low approaching the day after tomorrow may not even exist today. How fast will it come? Up to 50 knots NB, 30 knots = 720 miles per day, 50 knots = 1200 miles per day. How rapidly will it deepen? When and how much will it turn away - usually to the left (north)? In the showery air stream behind a cold front - variable wind and weather with showers. Gusts-And-Other-Wind-Changes, thunderstorms, squalls. Such details will not be predicted accurately. When will they collapse - not usually a 24 hour forecasting problem although one that computers usually handle well. Could be embarrassing if you are committed to get back home in three days� time! And even more embarrassing in the middle of Biscay!! How quickly will they form? Again, models generally perform well nowadays. Minor shifts in position or shape may of a high may lead to marked wind and weather effects e.g. fog near the East coast, showers or no showers. Then there are local effects, sea breezes, headlands, straits, gusts, down draughts. David Houghton's book Weather at Sea or Alan Watts Wind and Sailing Boats are both good reading. Remember the limitations of the phraseology. In the shipping forecasts "West" means 45 degrees either side. The Beaufort scale already implies a range of wind, but the weather does not know itself to within one force. Nothing is certain in the forecast, except for the date. Even then, you have to keep the theologians out of the discussion! This page originated as notes for a Hallberg Rassy Owners Association Weather Day. The emphasis on this course was very much on a practical and pragmatic approach to using what must be a very imperfect tool. Plan for the worst, hope for the best. The worst may not happen.